Himachal Pradesh is a mountain state that straddles the foothills and the high mountains of the Himalayas. The hill stations of this state are particularly well known, for Simla was the summer capital of British India and the Kulu Valley is an idyllic escape from the summer heat of the plains. The Kulu Valley in particular is also associated with shawl weaving, but the state is best known for its embroidery arts that centers around the little town of Chamba. From the early eighteenth century to the beginning of the twentieth, Chamba and its neighboring hill states, such as Kangra and Basohli, formed the nucleus of rumal production, embroidery work on thin unbleached muslin (malmal) was of great charm and simplicity. Rumal means cover or handkerchief, and these square-shaped textiles were used mainly as a covering for gifts. When an offering was made to temple gods, or gifts exchanged between the families of a bride and groom, an embroidered rumal was always used as wrapping. 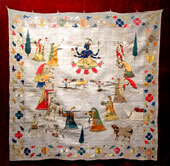 Chamba rumals were also used in temples and homes as a backdrop to, or canopy for a deity. The regions rumals shared the same basic composition like comprising a floral border that enclosed a finely drawn religious scene set against a clear, unembellished and unembroidered background. The designs were initially drawn out in charcoal and featured scenes from Krishnas life and other mythological episodes, which were surrounded by clusters of willow and cypress trees and running animals such as tigers, horses and deer. Chamba and its neighboring hill states gave refuge to miniaturists of the imperial courts who fled to the hills at the break-up of the Mughal Empire during the eighteenth century. These painters were to find the school of Pahari (those of the hills) miniature painting. It was the Pahari School of painting that inspired the making of these textiles, but the miniatures themselves were not the direct source. Margaret Hall and John lrwin, in the book called Indian Embroideries, propose that inspiration came from the murals painted by Pahari miniature painters on the walls of the Rang Mahal, the residence of the ladies at Chamba court. Ladies at the court embroidered ornate rumals with the designs most probably drafted by professional artists. In the village, meanwhile, women were embroidering the same articles in a much more primitive folk style. Chamba rumals were embroidered in silks of soft colors, using small double-darning stitch, so that an identical design appeared evenly on both sides of the cloth, and double running stitch was used for outlines and details.